Exhibit B: Over the weekend I randomly picked up one of Shira's old Organic Chemistry Lab textbooks. As I flipped through the introduction, I came across the section describing the need to keep a lab notebook. One of the recommendations included was to never erase anything. If you made an error, you were supposed to cross out, not remove, the text. This would raise fewer questions about the integrity of the notebook. 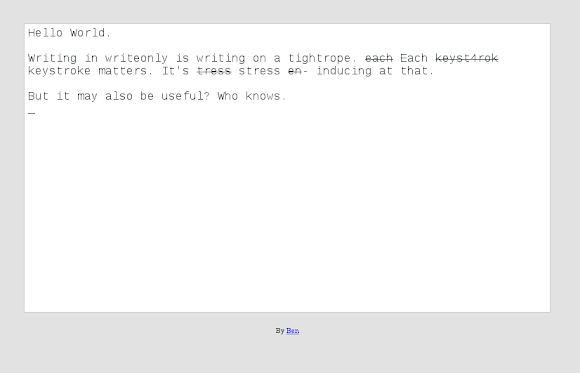 These two ideas swirled in my head and came out as: writeonly, an experiment in append only writing. 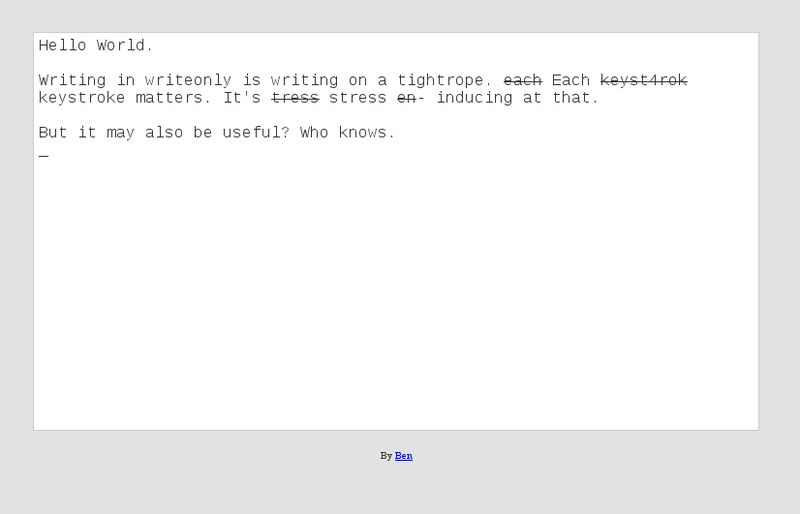 When you click over to WriteOnly (here, try it now), you're taken to a blank page that allows you to enter in text. You can't, however, backspace, delete or otherwise change the text. The only "feature," if you can call it that, is that two -'s in a row strike out the previous word. At this point, WriteOnly is a trivial experiment. If I thought it was useful (or heck, if you thought it was useful), I'd have to hook it up to some persistent storage. But once that's done, the 'app' should be ready to use. The bigger question of course is, is there any use for this bad boy? Play with it and let me know. I am watching for your blog post when you release this for org-mode. MS Word has a feature like that, change tracking. Different purpose, same result. Track Changes, Google Doc's revision history, subversion, git, etc. - they all let you tweak and see multiple versions. What I'm playing with here is the notion that you can't change what you've written.